Each year, CEPI takes advantage of the first trimester to compile last year’s data from our member associations related to the state of the real estate market. In the recently published Annual Report 2010, these figures are gathered in a series of comparative tables, which include general economic data and mainly related to real estate: fixed interest rate on loans, average duration of loans, average percentage of the loan in relation to the value of the property purchases or the evolution of sale and rental prices for houses or apartments since 2009. These tables also provide an overview of the existence of local, regional or national assistance for the renovation of buildings or for people with low income to pay the rent, the number of individual property agents or property managers in the country, as well as, in a context following the economic and financial crisis, the percentage of estate agencies or property managers’ offices which ceased operation in 2010. Such a compilation of pan European information enables a comparison of markets in different countries at a glance: in some countries for example prices of sales and rentals have increased in 2010, in some other, they have clearly decreased… All data related to previous years can be found in the “Markets” section of our website. 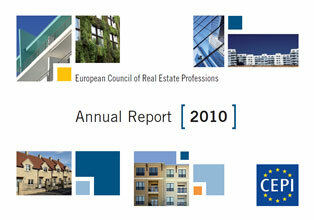 The Annual Report also includes our recent interviews with key EU decision makers, Commissioner Barnier and Bernadette Vergnaud MEP, on hot topics for real estate professionals: the Single Market Act and the upcoming revision of the Directive on the recognition of professional qualifications. It also presents the new European real estate portal www.worldproperties.eu. CEPI has indeed partnered with ICREA (the International Consortium of Real Estate Associations) to develop a new property portal, www.worldproperties.eu, designed to serve the needs of European property professionals and consumers seeking to sell or purchase property outside their national markets. The project aims at supporting the business of real estate agents who increasingly work in an international context. While the market may slow in one country, as one can see in our annual overview, there are buyers elsewhere looking for properties for both personal and investment use, and WorldProperties.eu is the place to find these properties in Europe.